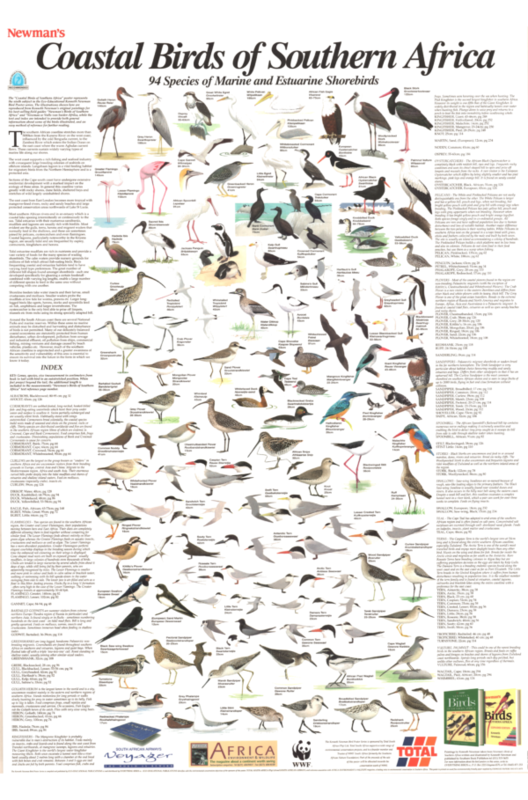 94 species of marine and estuarine shorebirds are featured on this poster illustrated by Kenneth Newman. Among the bird families represented on this poster are: albatross, avocet, cormorant, duck, egret, flamingo, greenshank, gull, heron, ibis, kingfisher, osprey, oystercatcher, pelican, penguin, phalarope, plover, sandpiper, stork, swallow, tern, tropicbird, wagtail, & whimbrel. Southern Africa’s shoreline is approximately 5000 km in length from the Kunene River on the west coast to the Zambesi River which enters the Indian Ocean on the east coast. The cold Benguela current down the west coast supports the rich fishing and seafood industry and large colonies of seabirds breed on offshore islands. Langebaan lagoon is a vital feeding habitat for migratory birds and is a protected area. The east coast from East London becomes more tropical with mangrove-lined rivers, rocky and sandy beaches and large protected conservation areas northwards of Lake St Lucia. There are several National Parks and marine reserves around the South African coastline. Here no marine animals may be disturbed or harvested and birdlife is protected. Much of the country’s coastal ecosystems are protected from human and industrial development or pollution. However much of the southern African coastline is unprotected and a greater awareness of the sensitivity and vulnerability of this area is essential to ensure its survival into the future.